After much deliberation, a little while ago I gave into temptation and finally treated myself to the Too Faced Sweet Peach palette. And it was certainly money well spent! If you haven't got your hands on this yet, then this post is about to give you the lowdown. Encased in a pretty orange pink tin, complete with embossed peaches on top, the palette already looks lovely before you even get to opening it. And when you do, you are greeted by a delightfully peachy scent that just makes it even more of a pleasure to use. My go-to palette has always previously been the Urban Decay Naked 2, simply because the warm shades work perfectly with my dark eyes and paler complexion. But, when I bought this, the Naked 2 was facing some stiff competition. There is not a shade in this palette that I don't like. The shadows in this palette are a mixture of matte, shimmer and slightly more glittery. I would say that the majority are quite shimmery though, which is something I really favour. I like that you can use shades such as 'White Peach' and 'Peaches and Cream' as a base and then build your look. I found that so many of these shades really complement each other and I especially like that when you receive the palette you also get a little pamphlet showing you how to re-create three different looks. This really encouraged me to step out of my comfort zone a little bit when using the shadows as the brochure matched together shades that I may not ordinarily have gone for. As I have had the palette for a few months now, I have been using it quite frequently. What impresses me most each time that I do is how pigmented the different shades are, how easily they blend and how long lasting they are. I have yet to use this palette with any primer and honestly, I don't think I need to. There is no fallout and my makeup just stays perfectly. From left to right: Caramelized, Candied Peach, Just Peachy, Georgia, Cobbler, Luscious, Peaches 'N' Cream, Nectar and White Peach. From left to right: Talk Derby to Me, Delectable, Charmed I'm Sure, Summer Yum, Peach Pit, Tempting, Puree, Bellini and Bless Her Heart. When I ordered my palette I received a free sample of the Sweet Peach Creamy Peach Oil Lip Gloss. 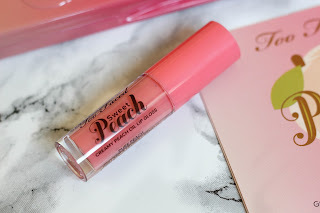 I got it in the shade in 'Pure Peach' which, upon first application, I thought seemed to be a bit brighter than I expected but it really settles onto your lips and looks super natural. There are seven other shades, so I am keen to try those as well. They are really nourishing for the lips on account of the fact they are formulated with peach oil, coconut oil and vitamin E.
While I have used and loved other Too Faced makeup, this is the first palette from them I have tried. Given how impressed I have been with this one, I definitely want to try some others. Leave me some comments below if you have any favourites you could recommend. The palette retails at around £39, which is quite standard for a palette of this size. It is available at stores such as Debenhams, which is where I picked mine up from. I don't own a Two Faced palette yet and you've made me want one! so handy that it gives you a leaflet with three looks you can create in!